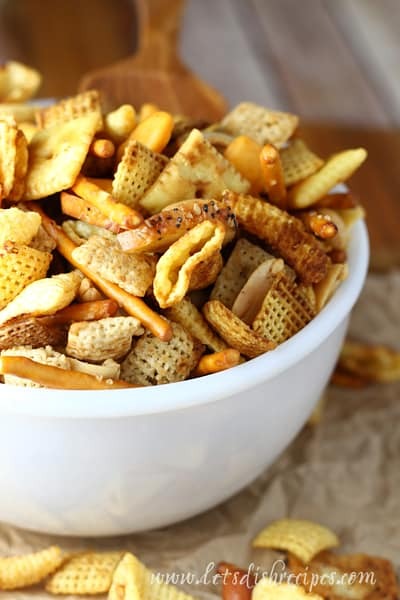 ULTIMATE CHEX PARTY MIX — This classic party mix is elevated with the addition of a few special ingredients like Bugles and cheese crackers. It’s the perfect snack for game day, holiday gatherings, road trips and more! 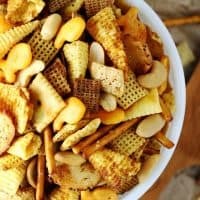 I don’t know how this Ultimate Chex Party Mix became a seasonal snack at our house, but if I didn’t make it during the holidays, I’m afraid there would be a mutiny! My family–especially the teenage boys–go through this stuff so fast, it’s hard to keep up with demand. It’s not much of an exaggeration to say I make Chex Mix by the truckload between Thanksgiving and Christmas. Okay, not the truckload…..but I always make a double or triple batch in my electric turkey roaster. You just can’t fit that much Chex Mix in the oven, and I actually prefer the turkey roaster because I just have to take the lid off and stir as needed. The point is, we love this stuff, and I’ve added a few extra ingredients and perfected the recipe over the years so that it can truly be called a family favorite. First of all, this recipe uses a little more butter and seasoning than the traditional recipe. 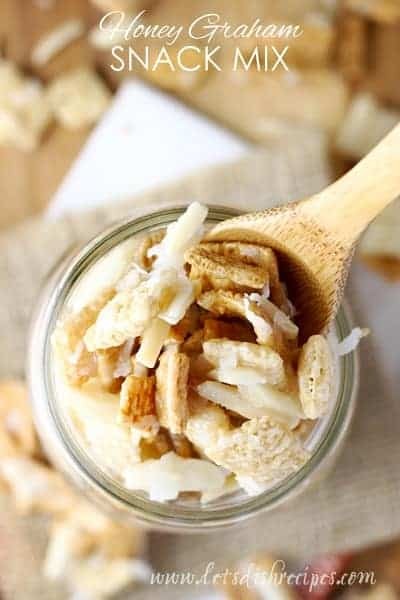 You’ll want that extra flavor to balance out the additional ingredients, like Bugles, bagel chips, Goldfish crackers and Cheese-Its. Of course, Chex Mix has always been a recipe that begs for adaptation, and these are just a few of our favorite additions. But I highly recommend the Bugles. They’re my absolute favorite ingredient! I always have a bowl of this out during the holiday season, and my family just can’t get enough. Now that I have two boys in college, traditions like this are even more important when they’re home for a visit! 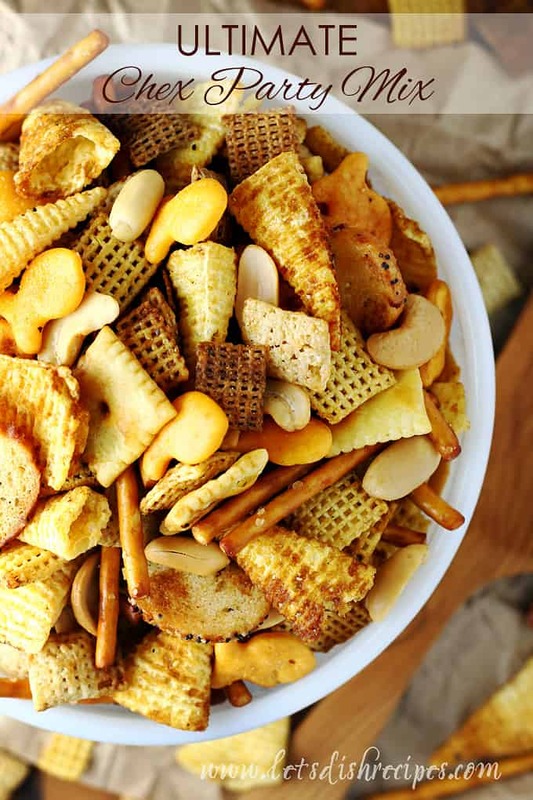 Of course, this Ultimate Chex Party Mix is perfect any time of year, whether it’s for game day, after school snacking, or any kind of celebration. So don’t wait! Make a batch (or a truckload) today! 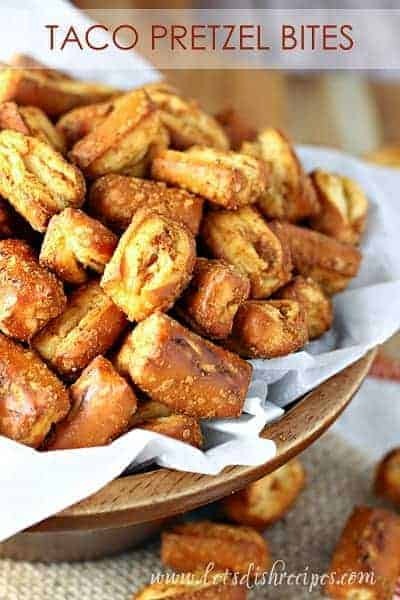 Be sure to save this Ultimate Chex Party Mix recipe to your favorite Pinterest board for later. 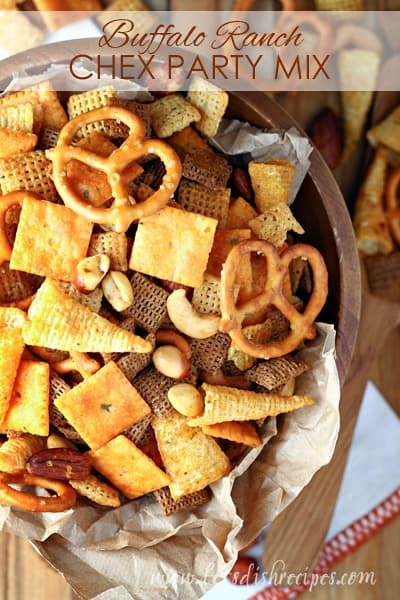 This classic party mix is elevated with the addition of a few special ingredients like Bugles and bagel chips. It's the perfect snack for game day, holiday gatherings, road trips and more! Preheat oven to 250 degrees. Combine cereals, pretzels, nuts, Goldfish, crackers, bagel chips and Bugles in a large roasting pan. In a small bowl, stir together melted butter, Worcestershire sauce, soy sauce and spices. Pour over cereal mixture in roasting pan and toss to coat evenly. Bake, uncovered for one hour, stirring every 15-20 minutes. Cool completely and store in an airtight container. To make in turkey roaster, use same temperature (250 degrees). Cover and bake for one hour, stirring every 15-20 minutes.